Tags: Systems thinking, Vanguard Method, service sector management. What people are saying about this book"Stuart Corrigan has done all busy and stressed managers a real favour with this book. It is short, crisp, full of evidence and spells out the issues that need our focus and action. In addition, he also generously and openly tells us how to make his approach work in our own workplace. This book offers its readers the chance to leave positive transformational legacies." "...very well written. It's easy on the eye, fun and interesting to read. …I've stepped away from it remembering what the messages are - now, there are not many books which can do that." "A little book with a big message. Here Stuart Corrigan reminds management of things we feel we know, and does so with compelling evidence. More importantly he points us away from common and superficial remedies; instead introducing a single powerful remedy that, while counterintuitive is, nevertheless, both proven and profound. A wake-up call for those who want to survive and thrive." "I worked alongside Stuart for several months when he came in as an external consultant to provide help and guidance to the company I work for. I learned a great deal during this period and have remained in contact with Stuart ever since. Once you understand the concepts that Stuart believes in, when the penny actually drops, you realise that everything he says and does just makes really good sense. The logic is actually relatively simple but it is also extremely powerful and effective. I would now like to tell you that it is just plain old "common sense" but unfortunately, whilst it does make perfect sense and it really works, in reality, applying it is not that common !!! If you want to give yourself a chance of gaining a competitive advantage, this is definitely worth taking a look at." 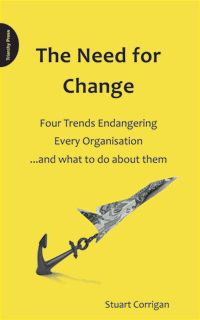 "The concepts behind applying systems thinking in service organisations are clearly explained here, peppered with amusing anecdotes and helpful examples. The context for the need for change is neatly set and complemented by the strategies that are needed to meet those challenges. The latter half of the book then sets out a simple to follow process to make the changes. I find that Stuart's writing on systems thinking makes more sense and is more practical than others on the subject. Thoroughly recommended."